Option 2. 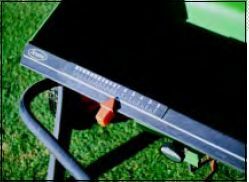 Calibrating a Drop Spreader by the Single Pass Method (see below). 2. Calculate the total area occupied by the house, sidewalks, driveway, plantings, etc., and subtract from the total area determined in the first step. 6. Place about a half of bag of product into the hopper. 7. 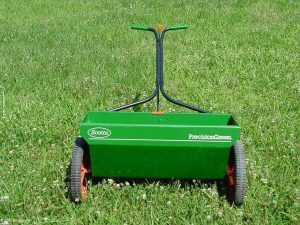 Push the drop spreader back and forth across the lawn until the product is gone. Fill the hopper with another half bag and repeat the treatment at right angles to the first application. Continue until 1 ¼ bags are completely used. Make sure that the wheel tracks of each pass slightly overlap the tracks from the previous pass. 9. If the amount of the product used (Step 8) is within 10 percent (high or low) of the label-recommended rate (Step 1), the spreader is calibrated correctly. If the amount of product is not between 90 and 110 percent of the labeled rate, (that is, if it is not within ±10 percent), reset the gate openings and repeat the process. In this case, 4 lb per 1,000 ft2 equals the label rate of 20 lb per 5,000 ft2. So no additional adjustments are necessary.